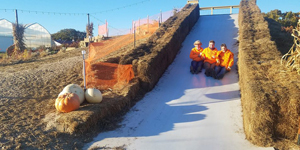 The large slide jumped to the top of everyones list of highlights last fall. Get corny in the Corn Box! 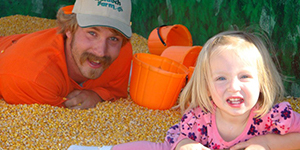 Wiggle your toes, let your imagination flow and giggle your time away playing amongst millions of kernels or corn. Guaranteed laughs for all ages. Choo, Choo! All aboard! Everyone is welcome on Grandpa’s Grain Train! Start your engines! 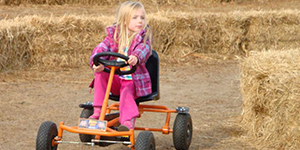 Put your feet to the pedals and make some dust on the Waldoch Farm Pedal Cart track. 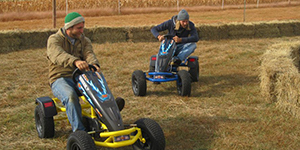 Race your family and friends for bragging rights. A track just for little ones with mini versions of their parents Pedal Carts. What’s that boom you hear? 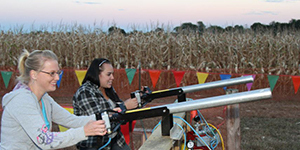 Corn cobs being shot out of a cannon – of course! 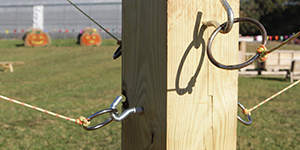 Sharp shooters test your skills and win a candy bar if you hit the target. Face painting provides color and fun for all ages! Choose from our wide variety of fall season designs. Preschoolers get to have fun too! 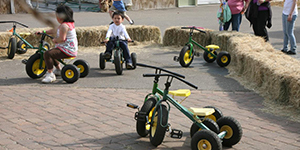 Let em rip on the Pee Wee Pedal Trikes, safely contained within a hay bale ring. Ready, Set, Go! 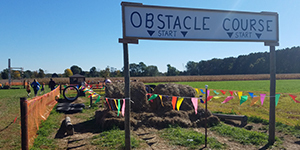 Challenge yourself by jumping over hay bales, climbing farm gates and ducking through a tractor tire. 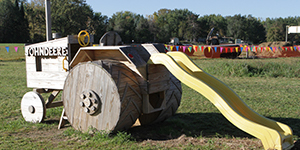 Race against each other on our two-track Obstacle Course. 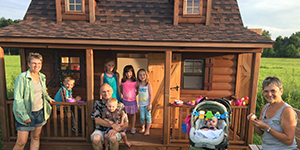 Join your friends in our Playhouses – Tables are set, dinners are made and imaginations run wild. 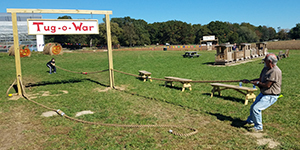 Divide your family into two groups or challenge a family that is enjoying the farm to a classic game of Tug-o-War. Better watch the time! This game will challenge you to the point you might lose track of time or will you be able to hook the ring on your first try? 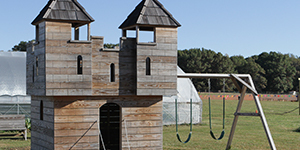 Fight off Dragons, Rescue the Princess, and Escape down the magical slides of the Pumpkin Castle. 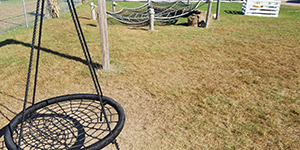 Get tangled up while climbing the Spider Web. After getting tangled up on the webs take a swing on the small web of fun. 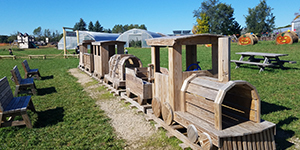 Kids can climb and play on the Wooden Tractor and Train. Makes a great Photo Op! Kids love winding their way through the Mini Maze. How fast can you solve this labyrinth? It might look easy to adults, but try to do it from your knees! 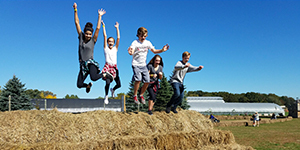 Jump for joy on nature’s trampoline made of a huge pile of hay! Just like the sandbox you have at home, but BIGGER! 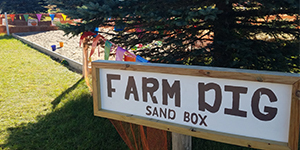 No need to bring your sandbox toys, we provide everything you need even benches for the parents. 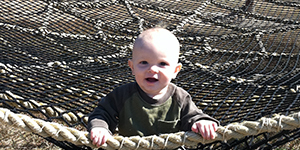 This simple activity is for the toddler in your group. 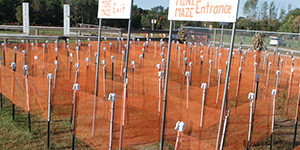 You can easily watch your child move through the entire maze. 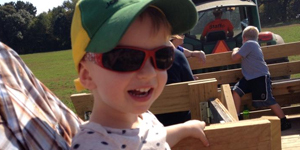 There is no shortage of places to take pictures with your friends and family around the Corn Maze. 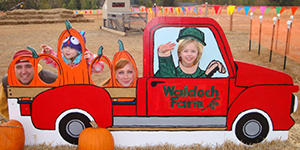 Take your family on a hayride to pick your pumpkins and enjoy a leisurely ride through the woods to our Pumpkin Patch. 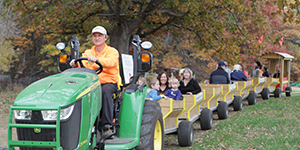 No need to struggle carrying your pumpkin out of the field – just put it on the wagon, sit back and enjoy the view as you are chauffeured back. 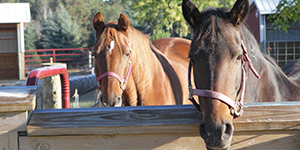 Take your family on a hayride to pick your pumpkins and enjoy a leisurely ride through the woods to our Pumpkin Patch. 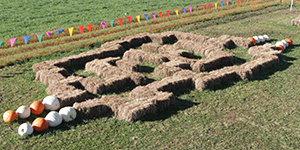 Weekday hay ride schedule is 11, 2, 4, and last one at 6 weather permitting except MEA October 16th-18th. No need to struggle carrying your pumpkin out of the field – just put it on the wagon, sit back and enjoy the view as you are chauffeured back.